The Banbridge Academy First XV lost their Schools’ Bowl semi-final on Saturday away to Dalriada School in Ballymoney. 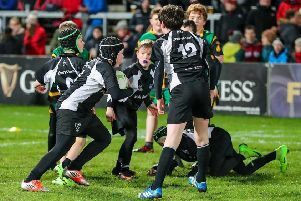 The 19-11 scoreline evidences what a close game it was but in the end the Academy just couldn’t contain their talented opponents and the Ballymoney school progress to the Bowl final on March 4. The game started well for the Academy when on five minutes full-back Daniel McElderry slotted a long range penalty to take them into a 3-0 lead. This lead was doubled on 20 minutes when McElderry landed another excellent penalty. On 25 minutes an Academy scrum on the right hand side saw No.8 and Captain Matthew Bell break down the narrow side and link with scrum-half Jay Pinion who showed good hands to squeeze away a pass to wing Ross Cartmill. Cartmill stepped the covering full back and dived into the corner to finish off and excellent score and take the lead to 11-0. Unfortunately McElderry was unsuccessful with the difficult kick. Dalriada tried to respond but Banbridge’s excellent defence and tireless workrate forced them into mistakes. As the half drew to a close Dalriada laid siege to the visitors’ try-line but magnificent defence denied them time and time again. The score remained 11-0 at half time. The second half, however, was another story. Dalriada upped their game considerably and their ball retention improved dramatically. Just five minutes into the half, but after some 15 phases, the home Out Half slipped a tackle and raced in under the posts for a try which their full back converted. On 45 minutes Dalriada attacked again and took the lead when after another set of physical carries from their large pack their flanker barged over the line for an unconverted try and a 12-11 Dalriada advantage. The Academy tried to respond but the players were obviously tiring after the onslaught from the burly Dalriada pack and despite valiant efforts from all the team they could not dent the Dalriada line. On 60 minutes Dalriada sealed the win when a good break from their pacey wing lead to a third try which was excellently slotted by the full back. Even though the Academy knew that eight points was probably too much to chase down they battled right until the end and finished the game in Dalriada territory trying manfully to force a score. While it was hugely disappointing for the team not to be able to make it to a third successive final the manner of their performance was something that in time they will be justifiably proud of. To a man they fought for every loose ball and every yard and were only defeated by a good team playing well. This match closes the competitive season for the 1st XV but training will continue as the 2nd and 3rd XVs are both still in their respective cup competitions. It was a hugely enjoyable season, and successful too, as the team lifted silverware in the form of the Wilson cup (versus Portadown College and Royal School, Armagh) and the 125 Trophy v CUS from Dublin.